If you're looking for a better priced alternative for California's Napa Valley or Sonoma County, head to Santa Ynez Valley to experience the same superb level of wine tasting and food at much lower cost. When pricey hotels like the Auberge du Soleil become the standard in Napa Valley, and the French Laundry, with its $240 tasting menu, is the sort of restaurant that Napa restaurants are comparing themselves with, you know it's gone a bit silly with the tourism-boosted inflation. In Santa Ynez Valley, you'll find the same beautiful vineyard rich scenery and outstanding food as in Napa, while missing out on pricing aimed at the black AmEx brigade. Just like in rival Napa, this is wine and food country. A vineyard picnic is the best way to spend the afternoon in the valley. Pick up a basket of bread, cheese, and salads at the Los Olivos Grocery store, then stop off at Melville Vineyards and Winery for a bottle of good wine. Now go find a comfy spot in the sun for a relaxing afternoon among the grapevines. Otherwise, take advantage of a vineyard tasting and learn some more about the great wines produced in the region. Take the opportunity to shop for wine. A great pinot noir from the valley will cost you a very reasonable $26 if you want to go shopping for wines to bring home. There's always an Italian restaurant serving Tuscan food in a wine region. Santa Ynez Valley's Tuscan restaurant is the Trattoria Grappolo. With its frescoed walls, delicious antipasti, a very impressive wine list, and that happy California vibe, it's a great place. An entrée such as calamari stuffed with smoked mozzarella is $18. 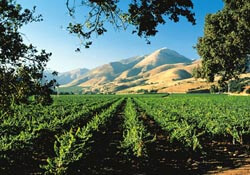 With much better rates in winter, Santa Ynez Valley has some decent options. The Ballard Inn & Restaurant is one of the coziest inns around this region and rates are substantially lower in the winter. They run a Winter Package special with a double room from $165. In high season, rooms can run up to $225 per night, still making this a far less expensive choice than similar hotels in Napa or Sonoma Valley. Try booking with our hotel booking service to get the best rates. Fly JetBlue to Long Beach, Southwest to LAX, or one of the major airlines to Santa Barbara. Then head off in your rental car to the valley, about 150 miles north of Los Angeles. Last updated by jack on 09 September, 2012 in Destinations. I lived near from there and it´s really a nice place. Jack is right in his comments. I could you like to go there again some day. I like pretty much all kinds of cooffe that has in USA. I missing this as well.